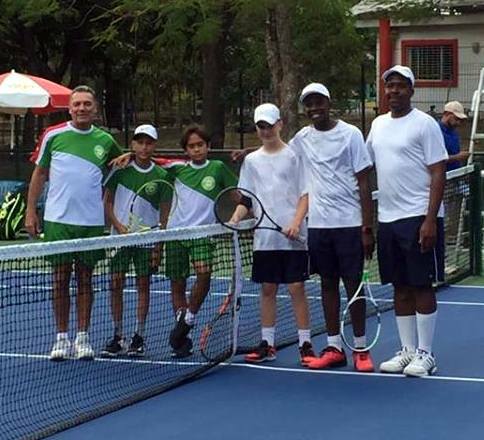 Bermuda’s Under 14 Boys team of Antonio Warner, Bobby Bart and Mackai Whitter continued competing in the ITF World Team Junior Tennis Competition in Santo Domingo. The Bermuda team are in the Main Draw for a spot in the top 8 and they would take on the 5th seeds Costa Rica and they went down 3 – 0. Warner would go down in straight sets 6-1, 6-1 in his one hour and five minute battle against Andres Caceres. The second match was a marathon that saw Whitter fall to Adrian Quiros in a three set over two hours and twenty minutes battle 2-6, 6-4, 6-1. The Doubles team of Bart and Whitter would fall to Javier Araya and Caceres in straight sets 6-2, 6-4.